This step can either be completed with the first link, which includes a large bundle of everything you’ll need, or, use the drop-down menus to find other options (for example, if you already have an IDE). Android seems to prefer Eclipse. Had some trouble with this in Win8, needed to allow more permissions for the folder where it is holding the images and whatnot. I installed the 1.8.x Release of Subclipse, which corresponds to Subversion 1.7.x Awesome, now get developing! What, you need more? Read on then! 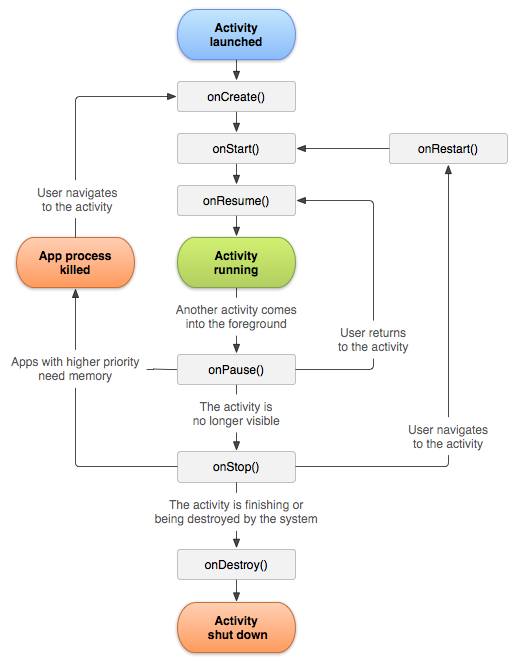 An important thing to note (and indeed, something central to Android and all apps), is that the Activity Life Cycle is super important. If you pay no attention to this, your app may not start, may lose data, and even act sporadically. Therefore, study the following diagram, as well as the life cycle as whole. Or perhaps this illustration from the Reference section will appeal to you better.